with the spirit of an Aventuress? Perhaps you are one yourself! Whether as a gift for an inspiring, impassioned woman you know or as a gift to treat yourself, you won't want to miss your chance to win an Aventuress Skin Care Collection Gift Set! Created with care by Michelle Carter, specifically for the woman with an active lifestyle, the Adventuress Introductory Collection contains all the skin treatments and products a buy woman on the go requires to stay looking as fabulous as she feels. Carter researched intensively in preparing to create her skin care line, interviewing and collaborating with numerous biochemists and labs to determine the precise combinations of vital ingredients to ensure the Adventuress products would be both gentle to women with skin allergies and sensitivities, as well as effective for the needs of women on the go. 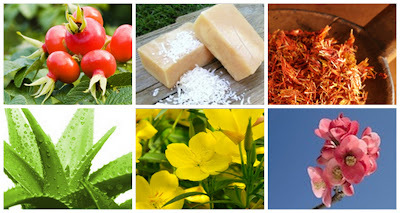 The array of botanicals included in her products are impressive, each with a specific purpose, creating unique and effective products to pamper and care for skin. Enter to win an Intro Offer Collection, an $85 value! It is as simple as a visit and “like”of the Adventuress page on Facebook! The opinions above are both honest and of my own experiences. I received no compensation in regard to this feature, I simply think the collection is fabulous! Information and images sourced from various Adventuress sites. That's What She Said is not responsible for this giveaway in any fashion. I need to be an adventuress. Thanks for the contest details. Oh La La .. What a fun set.. I may have to give Hubby a Hint.. This sure looks like a wonderful "Mom" pampering gift; thanks for sharing. Thanks for the chance, this is for me! I have tried there products before and really loved them and would love to try more of their products.